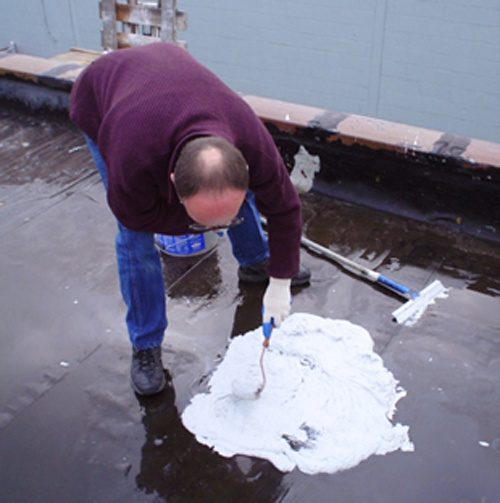 RUBBERKOTE 1047 is affectionately known in our roofing contractor community as “MIRACLE STUFF”. 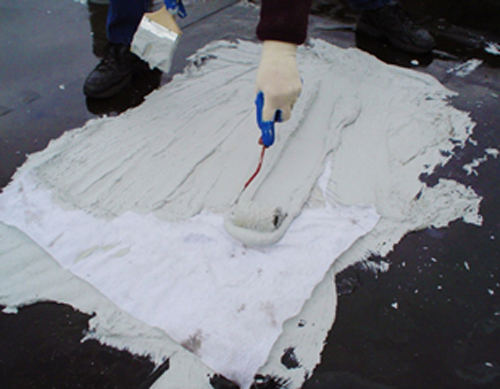 It is one of the only materials that actually works in the wet, in the rain and in the cold.. 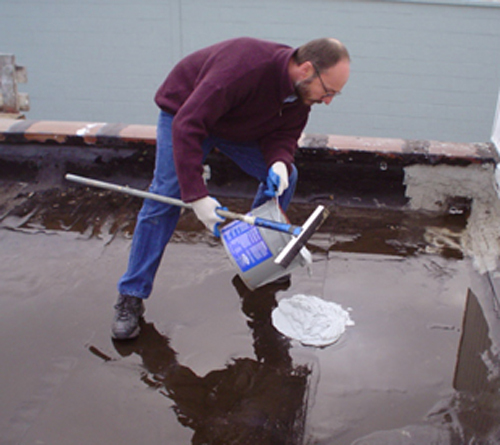 Here we had a leak on a smooth surface, modified bitumen membrane. 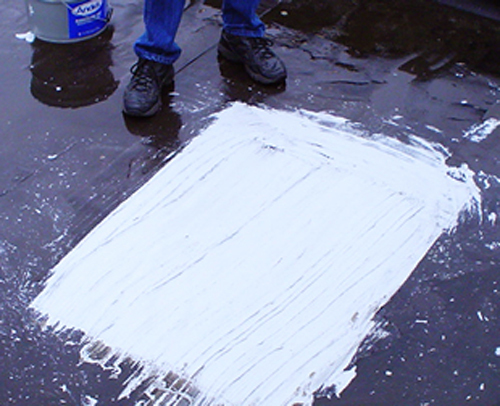 After the excess water was swept away, RUBBERKOTE 1047 was applied and spread over the general area. At this stage water is being pushed back from the surface by the RUBBERKOTE 1047. RUBBERKOTE 1047 has more attraction to the surface than the water. 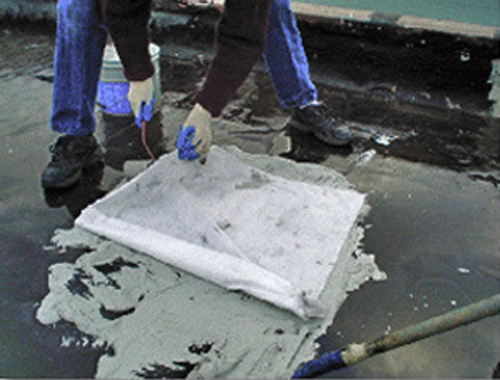 When the general area is covered, a piece of ROOFAB is cut and laid into the RUBBERKOTE 1047 as reinforcement. Brushing over the surface of the fabric pushes the RUBBERKOTE 1047 up through the ROOFAB to completely saturate it from below. This ensures that no voids, dryspots or fishmouths remain. 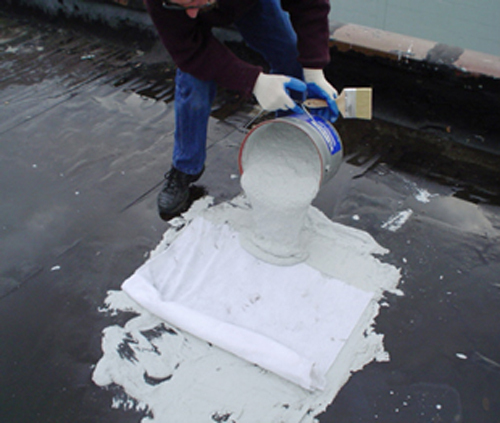 The surface of the ROOFAB is now covered with a nice, heavy coat of RUBBERKOTE 1047 to seal the repair and give a complete level of protection. The excess RUBBERKOTE is rollered in or squeegeed into the ROOFAB. 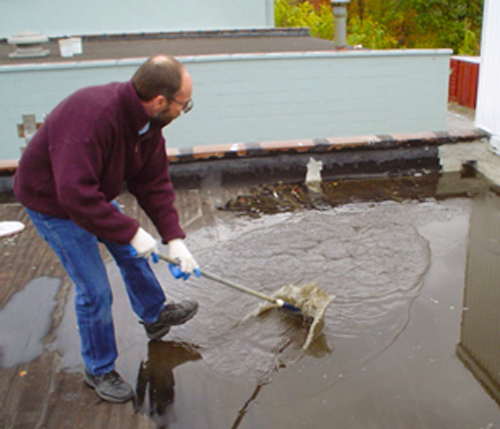 The completed patch has now waterproofed the roof and reinforced the split and damaged surface. The rain coninues to fall, but the repair is now watertight and well set despite the weather.